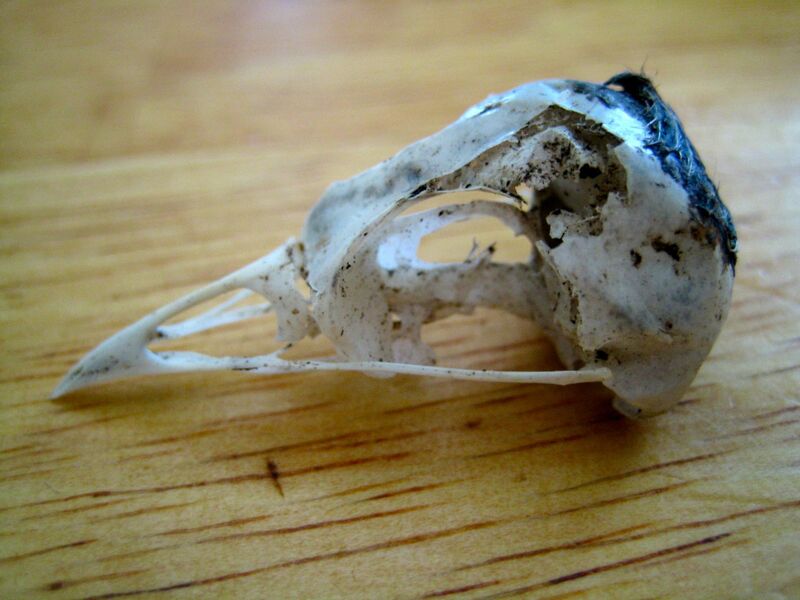 Yesterday I found a bird skull in the garden while I was weeding. I like the way there is a little patch of feathers on the top of it’s head, like a macabre toupee. In one of those cases of art foreshadowing life, I wrote a poem a long while back about digging up bird skulls. It is in my book. I really did bury some bird bodies in the garden – however, that was at my old house, so this bird skull is not one of those that I buried. Since I wrote that poem, my cat died of throat cancer. I didn’t bury him in the garden, though. I had him cremated. His ashes are in a little white box on the mantlepiece, wrapped with a yellow ribbon. but mostly because I want to dig up the skulls. A bird skull is a beautiful thing. goddess of change, of Your Time Is Up. threaded on leather, fastened with wood. on a bookshelf in front of my orange Penguin classics. Or, more inevitably, I will forget. that’s a very beautiful poem. Ooh, creepy! (In a cool kind of way, of course.) I also like the toupee. As soon as I saw the pic I thought of the poem. What will you do with your new creepy bird skull friend? Put it on my shelf, I think. Macabre indeed! Love the poem. lol! Thanks. I have a dark streak!